FILE - Andrew Yang, a candidate in the Democratic primaries for president, speaks at a town hall meeting in Cleveland, Feb. 24, 2019. Andrew Yang is not the typical U.S. presidential candidate. As a Silicon Valley entrepreneur, Yang has never run for elected office before. And he began his unlikely campaign a year and a half ago with virtually no name recognition — but a talent for social media. Yet he gained traction running on one major theme — the promise to enact universal basic income or a “Freedom Dividend” that has sparked interest throughout the country. Under Yang’s approach, every American above the age of 18 would be guaranteed $1,000 a month to compensate for lost income or jobs due to automation, artificial intelligence or the transfer of jobs overseas. “We have to solve the problems that got Donald Trump elected in 2016, and to me the main driver of his victory was that we automated away four million manufacturing jobs in Michigan, Ohio, Pennsylvania, Wisconsin, the swing states you need to win,” Yang explained during an appearance Sunday on ABC’s “This Week with George Stephanopoulos” program. “We’re in the third inning of the greatest economic and technological transformation in the history of the country, and we need to evolve to the next form of our economy in order for Americans to have a path forward,” he added. 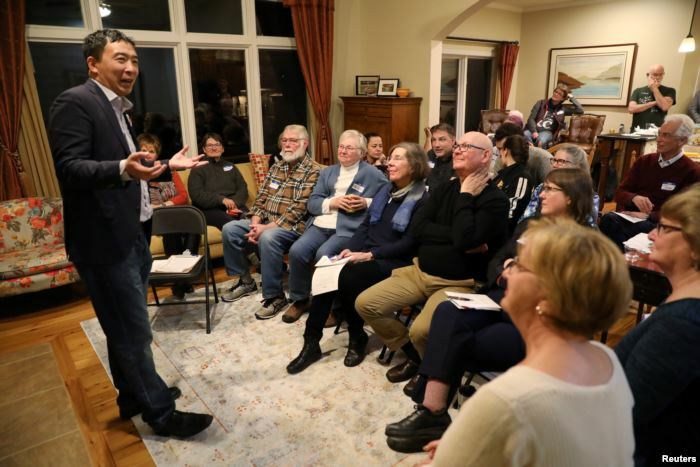 FILE – U.S. 2020 Democratic presidential candidate Andrew Yang speaks at Potluck Insurgency, a local Democratic activist event, at the home of one of its members in Iowa City, Iowa, March 10, 2019. Yang, 44, is the first Asian-American candidate to have gained significant national attention. He has met the threshold to participate in the first Democratic National Committee debates set for June after receiving campaign contributions from roughly 80,000 individual donors. His campaign also announced last week it has raised $1.7 million during the first fundraising quarter of 2019. Born in upstate New York to Taiwanese immigrant parents, Yang’s background has come to the attention of the Asian-American community that historically has had lower voter turnout compared to other groups. A lawyer-turned-entrepreneur, Yang became the CEO of the test-prep education company Manhattan GMAT that was later acquired by Kaplan. He then founded the nonprofit Venture for America, which trains recent college graduates and young entrepreneurs to launch their own startups. “He’s everything that we want to represent and we want to learn from. He’s an Asian-American, successful entrepreneur, business leader,” said Terry Hsiao, a Chinese-American entrepreneur at a recent informational meet-and-greet event with Yang in Washington, D.C.
A majority of the Asian population in the U.S. are second-generation, American-born children of immigrant parents. Politically, Asian-Americans tend to identify as Democrats by about a 2-to-1 ratio, according to AAPI Data, which compiles demographic data and policy research on Asian Americans and Pacific Islanders. Yang’s supporters are hopeful that as a Democrat with immigrant parents, he will be able to galvanize a majority of Asian-Americans to become more politically engaged. “Yang is closer to the Asian-American mainstream. So this is where having someone like Andrew Yang or Kamala Harris could mean more for encouraging Asian-American voter participation,” said Karthick Ramakrishnan, the director of AAPI Data. The UBI initiative would cost more than $3 trillion a year, according to the Center on Budget and Policy Priorities. While Yang proposes to pay for this with a value-added tax (VAT), economic experts say his plan may not be a suitable solution for the economy. According to Yang, a value-added tax on the production of goods and services makes it harder for large corporations like Amazon, Google and Facebook to avoid paying their fair share. Many developed countries such as those in Europe already have a VAT. “For the average American, they’d experience a value-added tax as something that they might pay a little bit extra when they buy something. 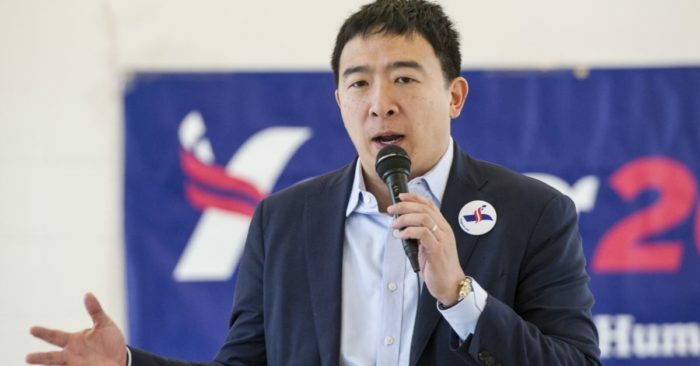 But keep in mind that in this case, we’re taking all the money from consumption like that and putting it right back into the hands of the American people,” Yang has explained.